What do you think? Leave your comment at the end of this post. When you enter the Masonic fraternity you tend to take a lot for granted. For example, that your Lodge will operate like other nonprofit institutions you are familiar with or the general laws and rules of the country and state where you reside. Interestingly, it doesn’t and, instead, marches to its own unique drummer. Aside from the obligations you take as a Mason, you are really not cognizant of the mechanisms of the fraternity or what you are entitled to. 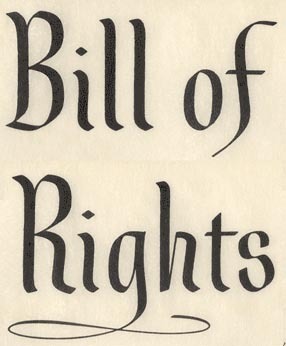 This caused me a couple of years ago to start seeking a “Bill of Rights” for the individual Mason. Remarkably, you don’t find very much in this regards. There is of course the Ancient Landmarks of Freemasonry, but this is more geared towards the administration of the Grand Lodge system. Masonic law differs from jurisdiction to jurisdiction, but it too primarily addresses the workings of the Grand Lodge. But finding a listing of the fundamental rights we should all enjoy as individual Master Masons is another matter altogether. To this end, I have assembled an initial list of rights. I began by examining the U.S. Bill of Rights as well as other comparable documents. I then reviewed drafts of my proposed rights with other Masons whom I respect. Below is my final draft of the rights all Master Masons in good standing should enjoy. Freedom of speech. The right for recognized Master Masons to assemble and discuss subjects pertaining to the fraternity in general, and the right of recognized Master Masons belonging to a specific jurisdiction to assemble and discuss subjects pertaining to their governing Masonic body. This includes the drafting and debating of legislation pertaining to the Master Mason’s Craft Lodge and governing Masonic body. Such discourse should be done respectfully and not violate Masonic obligations. Universal treatment. The right to be treated with equal courtesy and dignity as other members of the Lodge, whether at home or as a visitor, with friendship, morality, and brotherly love. This includes being treated fairly, honestly, respectfully, and helpfully by Masonic brothers and act as such in return; to offer wise counsel to Brothers when needed, and accept such in return; and to promote trust and cooperation between brothers. To avoid discussions in Lodge regarding religion and politics which may disrupt the harmony of the Lodge. Master Masons respect the opinions and dignity of the individual. Freedom of information. The right to be made aware of the actions and activities of the governing Masonic body of which the Master Mason belongs. This includes full disclosure of financial accounting, the rules and regulations under which the Masonic body operates, all records pertaining to the individual Mason (his own records), the names and contact information of Lodge brothers, and a report on the general administration of the Masonic body. Freedom to participate. The right to attend all recognized Masonic meetings and related functions while adhering to proper Masonic decorum. To volunteer time and service in support of the Lodge, the community, and the world at large. Fair trial. In all Masonic prosecutions, the accused shall enjoy the right to a speedy, fair and impartial trial, open to all recognized Master Masons, and judged by a jury of his Masonic peers. The accused will be informed of the nature and cause of the accusation; to be confronted with the witnesses against him; to have compulsory process for obtaining witnesses in his favor, and to have the assistance of counsel for his defense. Right to vote. The right to vote and ballot on all pertinent issues related to the Master Mason’s Craft Lodge and governing Masonic body. Right to representation. The right to expect the elected officers of the Craft Lodge to represent the collective interests of its membership, and that the elected officers of the governing Masonic body to represent the collective interests of the Craft Lodges. In no event are the elected officers of the Craft Lodge to usurp the rights or misrepresent the Master Mason, and in no event are the elected officers of the governing Masonic body to usurp the rights or misrepresent the Craft Lodges. Right to seek further light. The right for a Master Mason to seek out and investigate the secrets, history, and workings of the Masonic Order and to share such knowledge with recognized Master Masons. I have been over this list numerous times and have been very sensitive to the wording. Nonetheless, I am sure there is an omission I have undoubtedly overlooked or something requiring clarification or improvement. Consequently, I see this “Masonic Bill of Rights” as a work in progress and would welcome your suggestions for improving it. This list alone should make for some interesting food for thought, particularly for our younger Brethren as they embark on their Masonic career. This article is a reprint from its original posting on this site. I have been pushing for this for many years. But I would add a national Constitution, still keeping the seats of power at the state GL level though. We need to have more commonality in American Freemasonry and an American identity. Things are different today. You can breakfast in LA, lunch in Chicago and dinner in NY. You couldn’t do that a hundred years ago. So many people move about these days and live in many different parts of the country during their lifetime that we no longer can afford to be a nation of parochial, regional Masonry.